This is my fifth year participating in A Tidewater Gardener's yearly meme: My 10 Favorite Photos of the year. 2017 was a tumultuous year and I often turned to my garden for solace after reading the news. 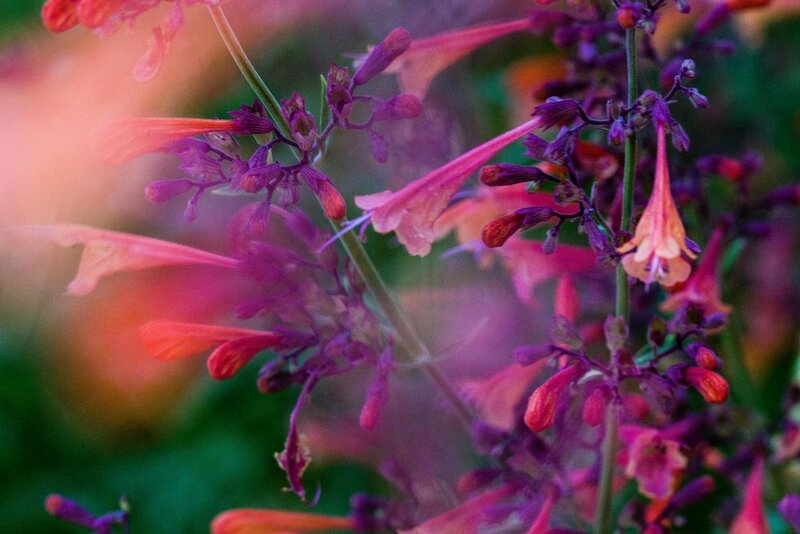 Looking through the lens of my camera helps me focus and enjoy the beauty in my garden. All of my favorite photos were taken in my garden. 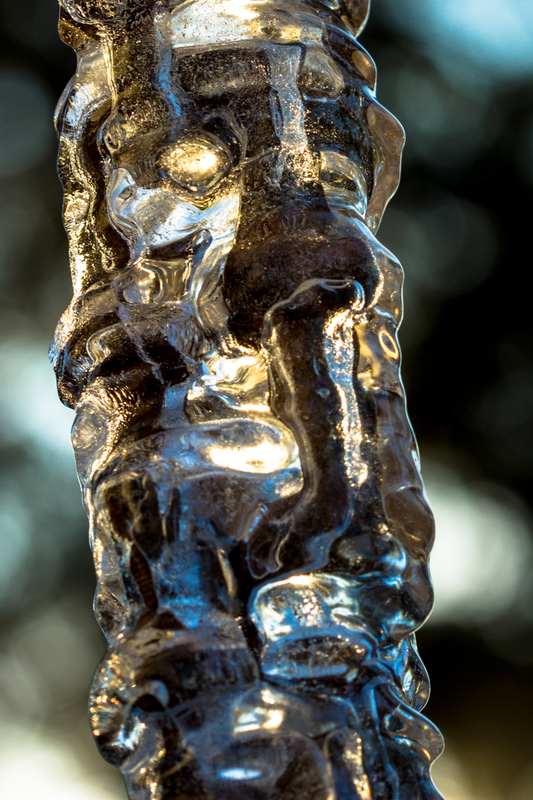 First up is the tiki I discovered in my ice covered rain chain with the winter sun glowing through it. Do you see it? 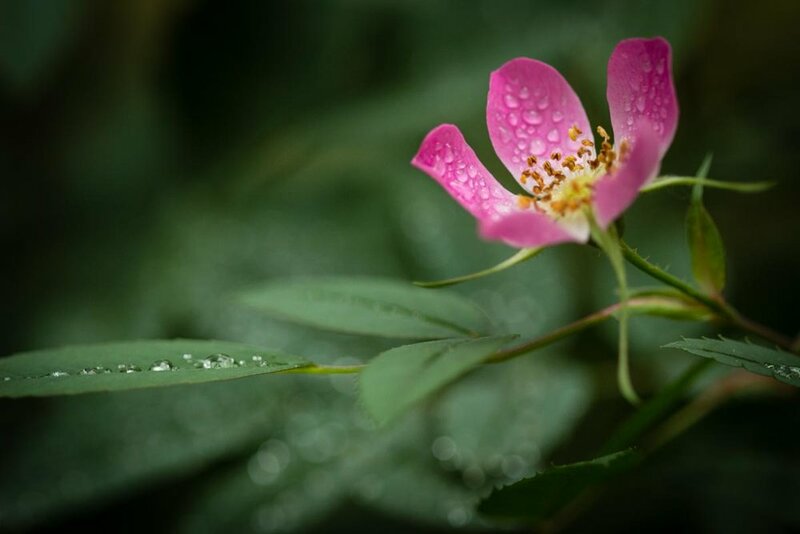 A soft misty rain coated the garden in fine droplets that made even the plain Rosa Glauca blooms shine. Our new pond is attracting dragonflies to the garden in the largest numbers that I've ever seen. This red dragonfly let me walk right up to it to take a picture of it with my macro lens. Simply stunning. The Asclepius fascicularis blooms, narrow leaved milkweed, looked ferocious this summer. I was enchanted by the large clump of Agastache 'Electric Punch' flowers that edge our front patio and all the hummingbirds and native bees that it attracted. I took this shot trying to capture bumble bees on it and all I captured were blurry fuzzy butts leaving the shot. Busy as a bee. I just love the details of the delicate bee wing. Our garden hums with pollinators during the growing season. I turned to my garden for comfort after hearing about the shooting in Las Vegas. A Pacific tree frog napped in a red zinnia flower in the vegetable garden as I weeded. Taking this picture lifted my spirits. Another Pacific tree frog was hunting on the Jasminum humile 'Sunshine' with the Agastache 'Electric Punch' in the background. The glowing golden fronds on the Five Finger Maidenhair Fern, Adiantum pedatum, remind me of butterfly wings. Our resident female Anna's Hummingbird posed for her portrait on her favorite perch, the spike winter hazel shrub, Corylopsis spicata. She's friendly with me and allows me to approach her with my camera. 2017 was definitely the year of the frog for me in our garden. They sang whenever we turned on the fifty feet of misters in our backyard. If you twisted my arm, I'd tell you that the frog on the zinnia bloom is my favorite from this year. Which shot is your favorite? Don't forget to stop by and visit A Tidewater Gardener to see his favorite photos.